The ecliptic longitude of Mars can be determined with the aid of Tables 46-48. Table 46 allows the mean longitude, , and the mean anomaly, , of Mars to be calculated as functions of time. Next, Table 47 permits the equation of center, , and the radial anomaly, , to be determined as functions of the mean anomaly. Finally, Table 48 allows the quantities , , and to be calculated as functions of the epicyclic anomaly, . Determine the fractional Julian day number, , corresponding to the date and time at which the ecliptic longitude is to be calculated with the aid of Tables 27-29. Form , where is the epoch. Calculate the ecliptic longitude, , and radial anomaly, , of the sun using the procedure set out in Sect. 5.1. Enter Table 46 with the digit for each power of 10 in and take out the corresponding values of and . If is negative then the corresponding values are also negative. The value of the mean longitude, , is the sum of all the values plus the value of at the epoch. Likewise, the value of the mean anomaly, , is the sum of all the values plus the value of at the epoch. Add as many multiples of to and as is required to make them both fall in the range to . Round to the nearest degree. Enter Table 47 with the value of and take out the corresponding value of the equation of center, , and the radial anomaly, . It is necessary to interpolate if is odd. Form the epicyclic anomaly, . Add as many multiples of to as is required to make it fall in the range to . Round to the nearest degree. Enter Table 48 with the value of and take out the corresponding values of , , and . If then it is necessary to make use of the identities and . Obtain the values of and from Table 44. Form . Enter Table 45 with the value of and take out the corresponding values of and . If then it is necessary to use the identities and . Form the equation of the epicycle, . The ecliptic longitude, , is the sum of the mean longitude, , the equation of center, , and the equation of the epicycle, . If necessary convert into an angle in the range to . The decimal fraction can be converted into arc minutes using Table 31. Round to the nearest arc minute. The final result can be written in terms of the signs of the zodiac using the table in Sect. 2.6. Two examples of this procedure are given below. Thus, the ecliptic longitude of Mars at 00:00 UT on May 5, 2005 CE was 2PI46. Thus, the ecliptic longitude of Mars at 00:00 UT on December 25, 1800 CE was 10TA34. 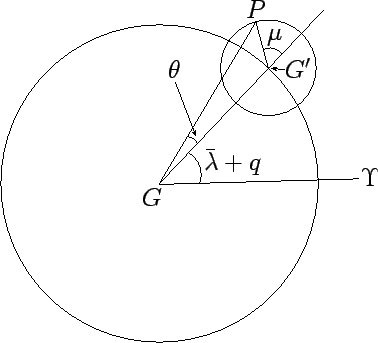 Figure 32: The geocentric orbit of a superior planet. Here, , , , , , , , and represent the earth, guide-point, planet, epicyclic anomaly, equation of the epicycle, mean longitude, equation of center, and spring equinox, respectively. View is from northern ecliptic pole. Both and orbit counterclockwise.